During this time of Ramadan, when we are to increase our good deeds, perhaps it is an opportune time to remember our mothers this way, to give them mercy and attention and love. It is recorded from the Prophet Muhammad, peace and blessings be upon him, that a man came and asked, "Who should I be the most concerned about?" The Prophet, alayhi salam, answered, "your mother." The man then asked, "and who after that?" The man again asked, "and who after that?" 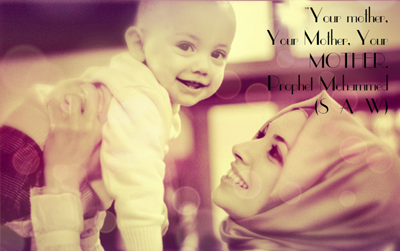 Again the Prophet Muhammad, alayhi salam, responded, "your mother." "And who after that?" the man inquired again. "Your father," the Messenger of Allah responded gently. In today's world, the elderly can seem like a nuisance. Even childbirth itself can be scheduled in. What regret a person might have after missing an opportunity to love and care for their aging parents because a) no one around them is, and b) it seems too difficult. Marriage is difficult. Having and raising kids is. Jobs are. How can we call ourselves human beings if we cannot see our own parents with mercy, as ones who too need God's care and love? To care for parents who are aging can take monies and sacrifice and the modern evil of inconvenience. But they are our heart. How can we abandon our own heart? Our mothers no matter what age can experience a need for our love that only a mother herself can taste. The unbreakable bond. The indescribable love. To shower them with attention and care can only begin to return the love they have for us. Then one of them asked the Prophet, alayhi salam, "Oh Messenger of Allah, if I were to carry my mother on my shoulders and I took her to Mecca, on my back, walking, three or four thousand miles- if I walk with my mother on my back and I did the circumambulations around the Kabbah, with her on my back, and I did all the rites for her, if I allowed her to perform all the rites on my back and I fed her with my hands and I performed everything that was needed for her, would I then have repaid her for what she offered me?" The Prophet, alayhi salam, said "All of this that you mentioned is not worth one of the pains that she had when she was in labor." "I was surprised to learn yesterday that in this country that they have specified a day and gave it the day Mother's Day. What is this? This is a mockery. To only have one day for the mother. All the days in all the years should be a celebration for mother from her children. It is not right that people should forget their mother all year and just on Mothers Day pick up the phone and say "Hi Mom. How are you doing?" This is not right. You should give her the Love continuously and give her the Mercy continuously, and long as it does not go against any of the teachings of Allah. "She needs someone to be next to her, to help her. You should do something great," he told a student who asked about her aging mother, "and go to your mother and serve her now. This is a great prayer." Many young Sufi moms recently talked about their experience at their masjid. 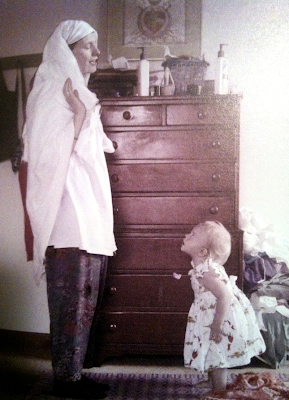 "Sufism helps me to stay grounded in the chaos of having two young kids," Jamila shares. Rahima, a mom of 5, shares that "the biggest challenge right now is how much of the world, or dunya, to let in." Sabira, a mother of two, agrees. "I want each of them to be in the world, but keep them safe from the world." Sufism offers a home base, guidance and God into these women's lives. Rahima explains that she loves the deep holiness of Sufism, and battles finding the holiness of the Sufi path in day to day mom operations. "There is so much in being a mom that's from the world- the diapers, the cooking. It's not subtle. How do I find the holiness in this?" Sabira answers her with support, "that all that you do IS the holiness- the bowing, the service." Outside, Salima, a mother of a two year old, eats dinner with her eyes looking half closed, her child near by, her head wrapped in her hijab. "The sensitivity of Sufism allows me to not override her. She's my outer heart I connect with. I connect with her heart through being programmed to be my own heart by this Path's teaching." Then she starts to laugh at her own exhaustion, " I have no idea what I just said!" Another Sufi mom walks by and is not available for comment. "No not right now...I'm in a blurb. I'm in a constant blurb!" she giggles. "The blurb of motherhood," she announces before hunting down her two year old, "is La ilaha illala." "Give, give, give," Salima says. It is telling- when approaching these women to talk about them- the moms- many end up talking about their kids, how to care for them, protect them. Perhaps this shows how surrendered they actually are to their station, the station of Maryam, the station of the mother. Back inside, They spoke briefly of themselves. Rahima says, "how can I be in the dunya so much with my kids and be with Allah?" "Keep Allah right in front of you," Sabira advises. These Sufi women are expected to follow their path straight, and belly laughed about feeling sweaty, covered in kids, up to their ears in laundry and diapers and everything else. "You smell like baby," Sabira tells Rahima. Rahima stays at home with her kids and her husband works full time. Sabira works part time, as her husband works on their newly acquired farm, building their home literally with his bare hands. He spends more time with the kids. "My shaykh said to do this," Sabira says. "It's hard because I feel some slack from other moms in the community. In the world, all those women totally get it and have to work too." The switch of traditional roles is trying for her. "I yearn for my kids. It's hard on my husband too. But he told me, 'I love my wife, so I am doing this.'" "I would love to get away," Rahima interjects, "get a job." Her baby is now crawling back into her arms. When asked about juggling their Sufi life with the one out in the world, Sabira shares that at her kids' preschool, other moms are always commenting about how her kids have deep love. "People say my kids are connected to their hearts," Rahima says. "Sufism helps you in motherhood hold each individual soul separately," Rahima says. "What is THEIR walking? What do THEY need? My Sufi path helps me look at each individual." Rahima is holding her 6 month old and says, "Sufism deepens my commitment to being her mom, in helping her to be a good person." The final mother is dashing down the drive. "Wait! Can you say anything about being a Sufi mom??!!" You're always lucky to get one of these women to hold still, which of course is a trait of moms the world over. This particular mom prayed and kept faith for many many years before having her new baby. "Um...sure!" She calls back. "Wonderful!!!!" Another mom, Sukaynah, pops into the conversation, lounging horizontally for about four minutes. Then two of her three kids linger in, and finally her husband opens the door and beckons her out. The whole interview process ends quickly. Rahima has to go home and cook her family's dinner, and Sabira has to get back to work. When I asked specifically what tools Sufism offers the endless, tiring task, they again just talk about the kids. Other moms and their small children wander in and of the mosque. They all have their heads down, keeping eyes on the extra small ones. Most of them aren't sitting around talking much to others. Their lives are wrapped in the perfect small souls they care for, who float and fly around the masjid like the angels they are. O mothers everywhere, throughout time and eternity! Bearers of Love! Full moons of Divine Love, reflected through the precious feminine form! Most important persons to the soul! Keys and Doors to Paradise! Foundation of Paradise! May the eyes of the heart of both men and women be opened to the inspiring spiritual reality of motherhood, the enlightening spiritual secrets of motherhood. The mystery of motherhood shines as Mecca, Mother of Holy Places, radiates as the Glorious Quran, Mother of Scriptures, and illuminates the entire universe as ummah, the spiritual community, Mother of the Lovers of Truth. The mystery of motherhood sparkles secretly as the primary Divine Names, Rahman and Rahim, which derive from the single Arabic root meaning womb. 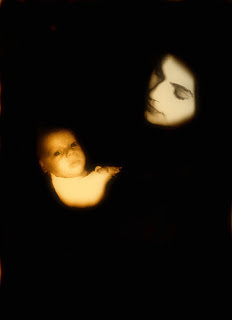 The mystery of motherhood glows delicately as the spiritual pregnancy of the heart of both men and women along the mystic way. This rich spiritual mystery manifests in a special sense through all women. and Protector of all Worlds! O Glorious One!